Dr. Christopher Powell has had a passion for healing and helping people since he was a child. A pivotal moment came in seventh grade, when a teacher explained that she did not take a pill for every little ache or pain she had, but rather let her body do the work it needed to do without interference, and if she needed to take a pill in the future, it would have a better chance of working, as her body would not become desensitized to its effects. This sparked an interest to understand the complexity of the human body. He began reading books on the brain and on physiology while still in middle school and throughout high school. 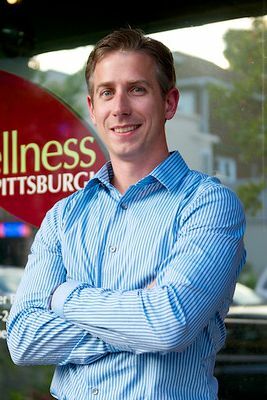 While seriously considering a career in Neurology, Dr. Powell had two distinct interactions that led him to pursue chiropractic. The first was learning of the changes that were occurring to managed care systems, HMO’s, malpractice and various other administrative areas within the local hospital system. The second was after Dr. Powell hurt his lower back playing football in high school. He went to see a local chiropractor, who, while helping with the pain, also explained the basic principles of chiropractic: that the body is self-healing, and the adjustments removed interference to the nervous system which improves body function. Within two weeks, the pain was gone. Within four months, his eyesight had improved to better than normal, and he no longer required eyeglasses. Within six months, he no longer had asthma symptoms or the seasonal bronchitis that happened every November. Dr. Powell attended Sherman College of Chiropractic after completing his B.S. at a sister school of the college. He currently lives in the Pittsburgh area with his three sons, Willem, Gabriel and Caedmon, all three of whom were born at home and adjusted within minutes of being born. Dr. Powell is certified to treat pediatric and prenatal patients by the ICPA, and regularly receives referrals from Magee Hospital and the midwife center.